The longer hair grows, the older and drier it gets. And that only makes it more prone to breakage and split ends. To keep your hair strong and glorious looking, stick by these simple rules. We all love to look our best — and when it comes to hair, that often requires a lot of pulling, teasing and hot tools. These methods, though necessary, dry out hair far more quickly than it would otherwise. Just as you give your muscles time to recover after a hard workout, your hair needs time to rejuvenate itself as well. If you know you won’t be seeing anyone you’re trying to impress, give your hair the day to recuperate by leaving it alone. Leave your straightener, blow-dryer and curling iron in the drawer and just let your hair be. You might not feel as stellar as you’d like to for the day, but boy, will your hair thank you in the long run! For those days where you can’t avoid applying those hot tools to get your hair looking how you want it, products are your best protection. Make sure you are using a good quality conditioner that will help protect your hair from damage. You can also choose to use a leave-in conditioner for some added protection that will last all day long. Conditioner helps keep your hair moisturized and when your locks are hydrated they are far less likely to dry out and split. Rule of thumb: Never skip on conditioning! Hair dressers may seem overly eager to trim your hair more than you say you want — but there’s some logic behind what they’re saying. It’s natural to think that the easiest way to grow out your hair is just to let it go. But at a certain point, its rate of growth slows down dramatically, and once a strand dries out and splits, it looks considerably less healthy. To avoid dry, limp locks, get your hair trimmed by a professional regularly. 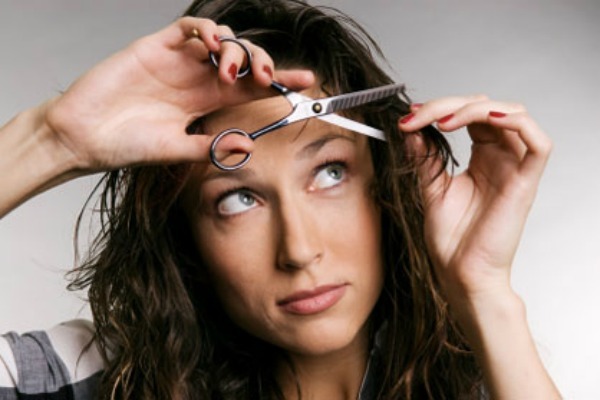 If you commit to getting your hair trimmed every two to three months, it will grow out far more healthy and flowing. Just as many of us can’t resist biting our nails, pulling on split ends can seem like fun at the time. And though the split end might seem as though it has disappeared, it has really just been ripped further up the strand, which means more of the hair is thinner and frailer. So, leave those split ends alone until you can get them trimmed off by a professional. Stick by these simple tips and you can have hydrated, healthy hair for life!